I bought my little dog Huckleberry a year ago. He was meant to blend smoothly into my pack of two, the oldest of which was very old: sixteen (Parsley). I wanted there to be a puppy for the middle dog (Gilly) to become friends with (back-up, to put it crudely) and asked the breeder for the quietest dog she had. Huckleberry, however, and however adorable, turned out to be the wildest little beast imaginable: affectionate, cheerful, clever as all get out… but wildly energetic: too much for a sixteen year old packmate to cope with. I took all three dogs to spend some time with Deena, who agreed that Huckleberry was too much for his ancient friend to cope with. I was very distraught and could not imagine letting him go, however much he disrupted the household. I spoke with Deena about this (tears flowing) and she offered, at first to keep an eye out for someone who might be able to foster him for a while. She then phoned me later that day and told me she’d be willing to take him in herself. Huckleberry stayed with Deena for over two months during which time he began to settle down. I came to her house and spent an hour walking with him every day and between the two of us we taught him how to be the very good dog he is today. He loved the companionship of the other dogs and he was happy with her. He’s been home for a long time now and every bit the joy Deena and I knew he could be. Dear Parsley had to be put down about a month ago. Gilly went into terrible mourning but Huckleberry has been her constant companion. As I write this I can hear them on the floor above, rioting and running between the rooms together. 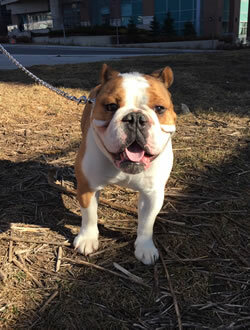 Before I brought my bulldog Charlie to Deena, I was worried I would have to give him up or put him down. After only minutes with Deena it was obvious that she has an ability to communicate with dogs in a way most of us do not. Over the past 4 months Deena has helped reduce Charlie's anxiety, and has significantly improved his behaviour on walks and inside the house. It is obvious that both Charlie and Deena have a soft spot for one another and it is such a relief to have someone I trust to take care of him when I'm not able to. She has been incredibly accommodating with his training schedule and has even taken care of Charlie when he was sick and I couldn't stay home during the day to take care of him. She is warm-hearted and passionate about dogs; we couldn't have picked a better person to help us with Charlie. 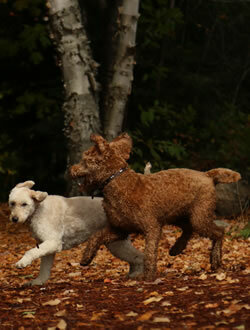 Our two goldendoodles just "graduated" from a 2 week board and train with Deena Cooper (Deena Speaks Dog). We have a 9 year old who needed a refresher course in her manners, and a 9 month old who is adorable, but a total goofball and a general mess. We took the dogs over to her house (the training center and dog paradise) and handed Deena a list of issues that needed to be addressed. We returned and picked them up on Sunday, and got a full demonstration of all of their new skills and had our first "training" lesson on how to be better dog parents. My husband literally said it was getting different dogs back! It used to be a struggle to put on their leashes, walk them to the park, answer the front door, or stop them from chewing on anything but their toys. 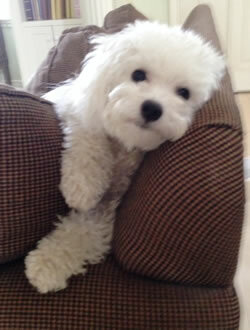 We realize that dog training is an ongoing process, but Deena has been fantastic and we are all much happier. We would recommend Deena's board and train without any reservation.